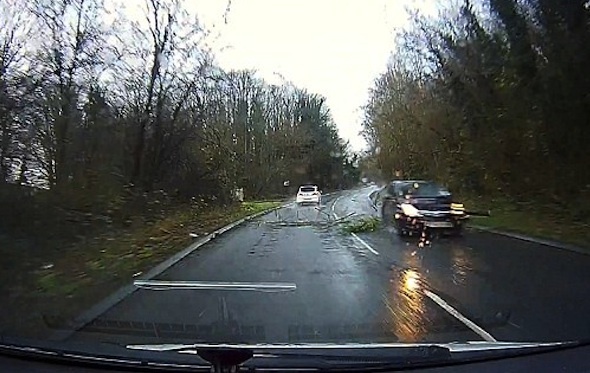 Two cars were lucky to miss being hit by a falling tree while travelling down a busy road near Chatham, Kent. The footage was captured on a dash camera mounted to driving instructor Geoff Watkins' car, which was travelling down the 50mph road with his pregnant wife in the passenger seat. Seeing the tree fall, Watkins was forced to perform an emergency stop, just managing to avoid a much more severe accident. However, the car travelling in the other direction drove straight over the large branch at around 50mph, causing damage to the vehicle. Watkins told the Daily Mail: "I wasn't too shaken at all at the time, but looking back at it you see how much worse it could have been if it was a few seconds either way. "It could have landed on the other car's windscreen – or ours. "A branch speared a hole through the bottom of my bumper, through the front guard and straight into the engine block, but I don't think it has damaged the engine."